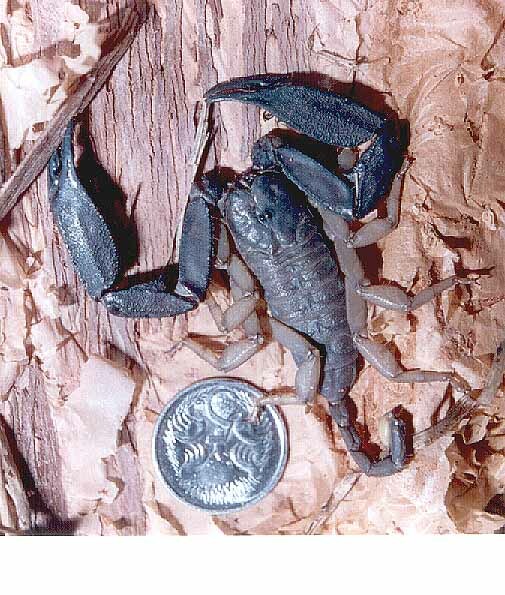 This species is often known as an Australian Rainforest Scorpion. Asia (Aru Islands, Indonesia, Moluccas, Papua New Guinea, Philippines), Australia (Queensland east coast from the border with NSW to the tip of the Cape, Papua New Guinea, Solomon Islands, New Caledonia and some small islands north of Australia. Also some reports of pockets found in far north Northern Territory and Western Australia. ), Oceania (New Caledonia, Palau, Solmon Islands). This species has mild venom according to people contacted. It will rarely sting, and usually defends itself by using the powerful claws. LD50 values are not available as LD50 testing has been banned in Australia for over 5 years. Claws are used for defence and can be very painful, if you get "grabbed" by them. Koch, L.E. (1977). The taxonomy, Geographic Distribution and Evolutionary Radiation of Australo-Papuan Scorpions. Rec. West. Aust. Mus., vol. 5 (2), pp.83-367. Liocheles waigiensis has very elongated, flattened bodies and powerful pedipalps. The body shape is adapted to living in rock crevices and beneath bark on fallen, rotting logs. Males are identified by claw features: a "tooth" on the moveable finger and a corresponding notch on the fixed finger just up from the finger joint (See picture by Peter Wright (C) HERE). Metasomas on both male and female are very thin with a characteristic yellow/orange vesicle although this colouration is viable for other Liocheles species. 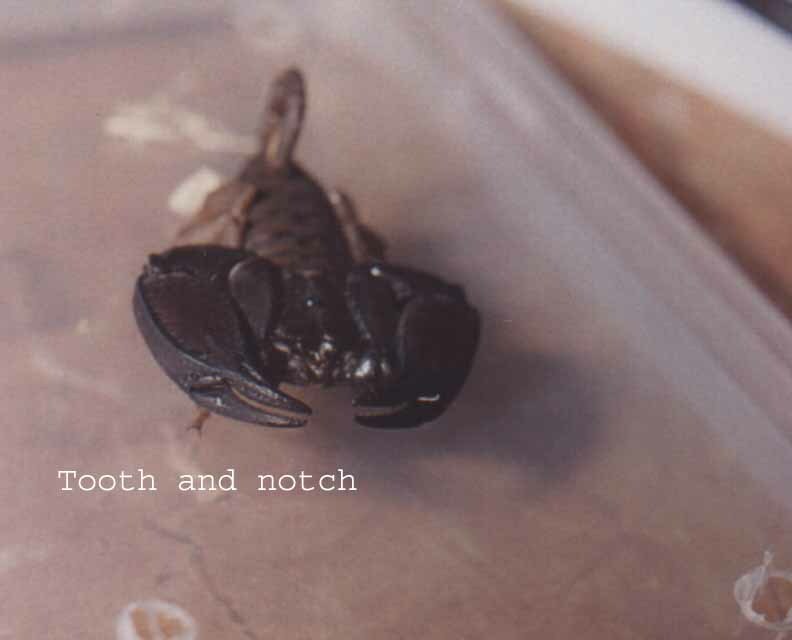 Species may reach 65 + mm (carapace to sting) with the male mesasoma slightly shorter and quite narrower than the females. This species is commonly kept in captivity in Australia, as it is large and non-burrowing like many Australian species. It is also very active at night. It is relatively easy to keep as long as temperatures and humidity are maintained (temperatures 20 to 30oC - humidity should be kept at over 90% for moulting and survival of 1st instars). Correct substrate and provision of rock crevices will also increase the life span. Captive birth is quite common but it would appear that in these cases, most females are gravid when caught. Males are rarer than females so most kept are females. Average litter size would appear to be approx. 20 to 25. Survival rate appears to be highly variable. Most people report minimal if any cannibalism. A number of people have reported young staying close to, and inter-reacting with the mother for up to two months. However correct humidity (high) and temperatures (20oC to 30oC) are also of upmost importance. Failure to keep the humidity high and temperatures correct will result in incomplete molting to 2nd instar. Moult to 2nd Instar is approx 28 days. Current research in France may separate L. waigiensis into six or more species. I have myself seen a "dwarf" species (for want of a better name) with all the characteristic of a L. waigiensis except for size. Females of this "dwarf" have been seen to give birth therefore are not instars of the larger L. waigiensis.